Today was a trying day for me. My brother is very ill and in the final stages of cancer and for the past couple of days as I go about my daily doings, my thoughts are mostly with him. For those of you who read the first installment of my memoir and know some of my history, he is the one I call the memory keeper and I hold him sacred in my heart. And, more mundanely, despite the fact that the whole world and his dog believes we are in the middle of summer, it was cold and it had rained overnight. The wind was howling and roaring over head in wild gusts. I didn’t sleep well and got up at 4 am to finish the latest painting. Five hours later the last flower was in place, the last leaf embellished and the mantra written. I’m in love with this painting! There is something quite magical about it and I am excited to share it. Turns out that I have missed a vital piece of information and my painting is too big and too inflexible to be put through any of the copy machines. If it is bigger than an A3, it has to be on paper to go through the flat bed scanner…. Don’t ask, I don’t know why, or how they work. That appears to be the truth of the matter – I got the same answer in two different places so that is that. No cards, no prints, no post-cards, no options, just the original. Battling the cold howling wind and with no sleep to sustain me, I got a little tetchy with the world! I came home and took some photographs, I propped her up in the corner and there she sits dancing happily urging me to ‘Choose Joy’. Bah, Humbug! I said to her in my best Ebeneezer Scrooge voice. I opened my email and ran my eye down the list, there was a post from the lovely Alys over at Gardening Nirvana. I thought, that will be a nice wee visit to help cheer me up, and opened the link. Imagine my surprise to see one of my paintings looking back at me – and then I read her words ….. You can follow the link to see what I read. All my grouchiness vanished in the twinkling of an eye. Wouldn’t yours? Who would elect to remain grouchy when it is so much more pleasant to feel that actually everything is just fine – it will all work out one way or another – it always does! Thank you Alys for that beautiful testimonial – in one of those wonderful serendipitous moments that we both love so much, you turned the sun in my direction at the very time I needed it most . That does indeed make you a true friend! So here is the latest whimsy girl. She is mixed media on a rigid canvas board measuring 35 x 46 cm. You can double click for an enlarged view. There are more options, tomorrow I shall call some printing places and see if they can help me out – there will be a solution! 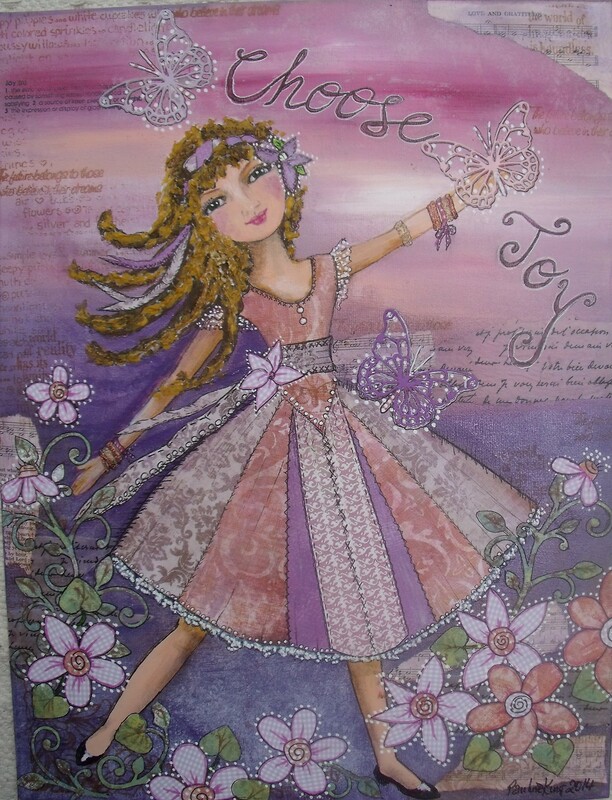 This entry was posted in Creations From My Craft Room, Mixed Media and tagged acrylic paints, Choose joy, mixed media painting, why be grumpy? by thecontentedcrafter. Bookmark the permalink. Sooooo sorry about your poor brother, wish him all the best. Just stopped by to say I was just thinking of you and your brother. Frank, I so appreciate your care! Hi Pauline, I am sorry to hear about your brother. As you think of your brother, we, your blogging friends are thinking of you. I know you will find a way to make those copies- you are a resourceful woman. I am glad that Alys brought a smile to your heart with her post. Thank you for the reminder to choose joy. I’m sending you my hugs across the miles. Be brave. Be strong. How are you doing Pauline? How is your brother? Thank you for your lovely note of concern Elaine. I am fine, holding my brother tenderly and with gratitude in my thoughts constantly, which is all anybody can do right now. It is a matter of time. First of all, I am so sorry about your brother and my thoughts will be with you both during the very hard days ahead. How lovely that Alys was able to give you such validation and support on a difficult day! Good luck finding the solution! Do you know why you can’t run her through the modern day equivalent of a gestetner (too bad if I spelt it wrong as no-one remembers them anyway! 😉 )? Because she is a perfect meld of nordic blonde loveliness and gypsy. She was meant for “YOU”. I love that you found a hug in Aly’s post. That’s what is so magnificent in this blogging lark. You can be feeling alone, brittle and like life’s quicksand is slowly ingesting you when suddenly someone gives you a hug from out of the blue from the other side of the world and your own troubles are put into perspective “someone cares!” Yes they do. We form a confraturnity of care when we blog and we start to engage with our dear constant readers. We form relationships that are no less important albeit minus the cup of tea around the table and the physical hugs. We humans find our comfort where we can and this online malarky has a lot of benefits :). Please consider yourself most emphatically hugged. Losing someone so very close to you is like going in for a swim and coming back minus a leg. It’s part of you and you can’t hide away from it. I hope your brother and the keeper of your memories is comfortable and at peace within himself. 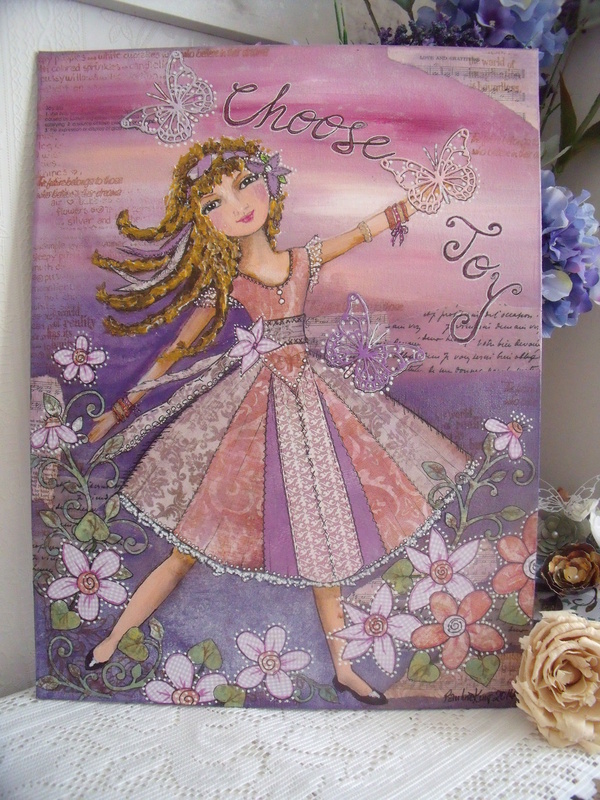 Huge hugs from Serendipity Farm and I think your nordic gypsy girl might just need to be mounted in a prominent place where you can see her to remind yourself to “Choose Joy”. Sometimes we create what we need to get us through lifes trying times. Your painting seems to be exactly what the doctor ordered :). I’m working on those word cards, for both of us. I was a little behind on my daily ones, am now caught up and will do one for me and one for you over the next few days. There is also another painting brewing ….. So I can be contemplative and introspective and retrospective for the next few days and quietly do what needs to be done for my brother and myself – and still be productive. :). Can’t wait to see your introspective/retrospective creation emerge in the sunshine :). Hi Pauline, I am sorry I seemed to miss this yesterday in my reader, I went back to find it after seeing this beautiful painting on Facebook. I love this, she is truly gorgeous!! I hope you can manage to find a way to get it printed but it looks like some good advice here. I am so sorry to read of your brother’s illness, I can only imagine how you are feeling. Know I am thinking of you and sending you lots of hugs, it will be such a difficult time for you. Are either of your parents still alive ? Nice to see your lovely print on someone else’s blog, what a buzz for you! We have had beautiful weather here but maybe yours is on it’s way! I’m glad you like her Wendy, and yes, tons of helpful advice, much to consider and research…….. I’ll be a busy girl for a bit. And thank you for your kind thoughts. No, we have no parents. I am now the eldest. It was lovely to see my print unexpectedly – and more especially to read Alys’ lovely words 🙂 Today became more summery as the hours ticked by – and the forecast is beginning to look up – I’m hopeful! Strength to you, and peace to your brother. Stay strong! Thank you Frank, peace is exactly what I am holding for him. … and I’m sure he feels your comfort! Pauline, I’m so sorry to hear of your brother’s failing health. I’m sad, too, for what this means to you. It’s very difficult not to feel the loss that comes with the slipping away of someone you love so deeply. I’m sure you feel it at every level of your being. I’m so glad you have your artistic outlet and that you continue to seek joy. You’re an inspiration. I love my print (and Elizabeth loves her original). We’re both smiling that we have the same piece of art (one print, one original) in our homes. Thank you Alys. My work is simply to hold him in my thoughts, I am in contemplative mode…..there is much to contemplate! I, too, am sorry your brother’s not well. We can’t change the path others walk on, but we can walk beside them. He’s lucky to have you in his life. As to the print; I’d try calling places that make street banners and the like, also where they make giclee prints of artwork. My younger son worked for years doing promotions for a skateboard/snowboard clothing & accessories wholesaler and they had a scanner / printer that did both. If you see a large banner, try asking where it was printed. Tom, thank you for your kind message, I appreciate it. Pauline, I can’t even image how you feel at this time. I am sorry for your brother. I am sure your love ease up his pain. On the other hand, it is amazing and inspiring that you choose joy, even in difficult situations like this one. This piece is a wonderful addition to your collection. It is whimsical!! I send you many blessing, a big hug and much Love! Thinking of you, Pauline. And I love this post. Your gals are magical, I can attest to that! You sent me an original and my life hasn’t been the same since! Sorry to hear about your brother, Pauline. I lost a younger brother to a long fight with cancer and it is tough. Many hugs. Your painting is wonderful and I love the message it brings forth…both in the girl and the words written on it…..choosing the positive! I’m so sorry to hear about your brother, Pauline. Cancer likes to go after the special people and I’m sure your brother is at the top of your list. My prayers are with him and your family. Your talent is amazing! What a beautiful painting to hang in a young girl’s room. Dear Pauline, I am so sorry to hear about your brother. His battle is rough, I will keep him + you in my prayers. It is so special when you have someone remind you how special you really are:-) I will head over there later today to read the post, she deserves a cyber hug! II have to go out in this horrible weather here at 6am:-), ready to move some where warm after this winter:-) Hope you get your prints made soon, she is so lovely:-) p.s. I found a ladybug in my kitchen it must of been in one of my soil mixes, how in the world would it survive in this weather…it came to visit…a lady bug! Things will get better when a lady bug visits! I’m with you on the moving thing – I’d like to head to anywhere there is a summer right now! The sun was up before me this morning and the wind had died away over night…….. and now at 8.45 am, the sky has become overcast, the temperature has just dropped and the wind is picking up again. However, for the first two hours of my day I enjoyed a delightful summer morning! Dani, thank you for your supportive words and thoughts! I have already let go of the ‘printing issues’ – I am so far behind with a couple of projects that I am relieved to be able to concentrate on them for the next couple of days. I shall happily play catch-up and get some balance back in my life! This blogging community never ceases to amaze me – so much love and support pours in ….. I think everyone should blog like we do and then the world would very quickly become a place of mutual support and trust and love. What a great place that would be! I am sorry your dear brother is so unwell. I am pleased to hear that Sharon, I’m glad you like them…… I’m excited to see my surprise critter 🙂 But no rush! I’m sure sorry to hear your brother is suffering so terribly Pauline. It’s a tragic thing to feel helpless and unable to change a loved ones circumstances. Hang in there, my thoughts are with you both. In regard to your gorgeous new artwork, it’s it possible to take a digital picture of you artwork for reproduction purposes? I’m certain that’s what they do with prints anyways. I might try that anyways. I read Alys’s post already too and in typical Alys fashion, she’s made the sun shine! Isn’t that just like her? I knew it’d make you day.